Beauty: Optimals Even Out Day Cream is on Offer! Optimals Even Out Day Cream is on Offer! Optimals Even Out Day Cream is on offer till 20th October 2011 - Save Rs 100 on each purchase! 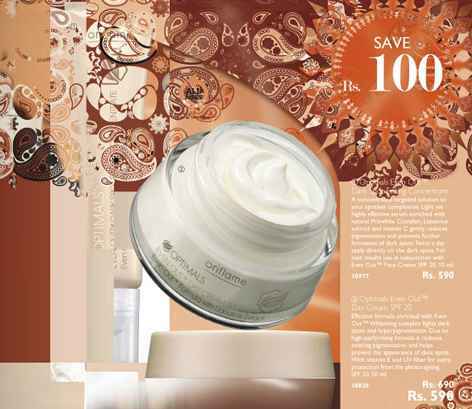 Optimals Even Out Day Cream has an effective formula enriched with Even Out complex that fights dark spots and hyper pigmentation that gives you a spotless complexion. Recently in a meeting with Oriflame Dealers in Delhi, Meenakshi was sharing with all present how much one of her customers love Optimals Even Out Dark Spot Fading Concentrate because it is so light and yet so effective. Further she shared that her customer applied this cream twice a day and in a few days not only did her pigmentation got reduced but as she continued applying, it prevented further formation of dark spots. This product is for all ages. If you have any questions you can write to me at jashmiw@gmail.com or leave a comment to this post. To find a consultant in your city just email me or sms me on 9820850522 the following: your Name, City, Area and Products you want. I will ask an Oriflame consultant who is living nearest to you to contact you.